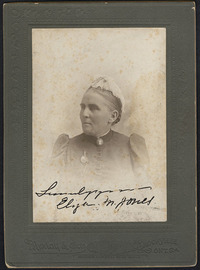 HARVEY, ELIZA MARIA (Jones), farmer, breeder, butter producer, and author; b. 24 Dec. 1838 in Maitland, Upper Canada, daughter of Robert Harvey and Sarah Glassford; m. 29 Nov. 1859, in Brockville, Upper Canada, Chilion Jones, son of Jonas Jones*, and they had three sons and four daughters; d. 6 April 1903 in Gananoque, Ont., and was buried in Brockville. The second eldest daughter of a prominent miller, Eliza Harvey was educated in Montreal and Scotland. The premature death of her mother forced her to stay home and care for five younger brothers and sisters. It was probably on her father’s farm that she first developed her pioneering interest in dairying and animals. In 1859 Eliza married Chilion Jones, a member of a prominent loyalist family in Brockville. The young couple moved to Ottawa, where Chilion, an architect and engineer, was working on the new Parliament Buildings [see Thomas Fuller*]. Following this project, they returned to their home, Brockville, where they had a small piece of property on the edge of town. In addition to bearing four children in the 1860s, Eliza started a small dairy operation. The property consisted of only a few acres, but she rented two small farms nearby. At first she acquired grade cattle and sold the small amount of butter they produced locally. Jones stated that it was her purchase of an outstanding Jersey-cross cow in 1873 that prompted her to breed purebred Jersey cattle. It was an inspired decision since the ideal cow at this time in Ontario was considered to be a dual-purpose animal, usually a grade, which could produce both milk and beef. Jerseys were derided as small and wasteful, unfit for beef and producing an insignificant amount of cream-rich milk. Jones, though, was impressed with the quality of the butter that could be made from their milk. Over the next few years, through “hard experience,” she learned how to make rich, perfect butter at a time when much Ontario butter was judged to be fit for use only as axle grease. Most butter was produced on farms by women under difficult and often unsanitary conditions. Usually only a small amount would be made on each farm and sold to local storekeepers, who in turn sold it to customers or packed it for export, generally without regard to freshness or colour and often in dirty containers. Jones, however, prepared her butter under the cleanest conditions, sold it at a premium price to many prestigious clients in Canada and the United States, and by the 1890s was shipping over 7,000 pounds a year. Among her customers in Canada were the Rideau Club in Ottawa and the dining-cars of the Canadian Pacific Railway. Jones’s initial purchase of purebred Jerseys had been from Romeo H. Stephens of Montreal, a family friend who had established at Saint-Lambert the first noted herd in Canada with animals obtained from the Royal Herd at Windsor. With this good breeding stock as a base, she built up a large herd. Her farm was a model of “scientific agriculture” where the cattle were housed in a gas-lit barn, which also featured a steam engine to power equipment. The Jerseys were fed a carefully balanced ration to help them produce the maximum amount of milk. To help with the labour, Jones employed three men but she personally oversaw all aspects of the farm, from keeping the books to supervising the butter operation. Her husband, who had little to do with the farm, appears to have been absent much of the time managing his brother’s shovel factory in Gananoque. In 1896, after most of her rented farmland was sold, Mrs Jones had disposed of half her herd to Benjamin Heartz of Charlottetown. She retained some of the cattle to “supply her own family.” Never one to remain inactive, however, she then devoted herself to raising and selling carriage horses and racehorses. She also began to write short stories and “light literature,” which she published in the Farmer’s Advocate. In the fall of 1902 Jones travelled to Gananoque to be with her husband, who was in poor health. While there, she fell ill and died. She was thorough to the end: after her death the rest of her herd of Jerseys was sold at prices she had already placed on them. She was survived by her husband and by two sons and three daughters, one of whom, Elsie, was a noted horsewoman. Further editions of Eliza M. [Harvey] Jones’s Dairying for profit: or, the poor man’s cow were published at Chicago in 1893 and Montreal in 1894; a French translation, Laiterie payante: ou, la vache du pauvre, appeared at Trois-Rivières, Qué., in 1894. She is also the author of an eight-page pamphlet, Lecture on co-operative dairying and winter dairying (Montreal, ). AO, RG 8, 1-6-B, 28: 32; RG 22, ser.179, no.3505. NA, RG 31, C1, 1871, Brockville, Ont., East Ward (mfm. at AO). Evening Recorder (Brockville), 7, 11 April 1903. Farmer’s Advocate and Home Magazine, 1890–1903. Globe, 7 April 1903. Ruth McKenzie, “Eliza Jones – Canada’s pioneer dairywoman,” Family Herald (Montreal), 25 Jan. 1968: 39–40. Canadian men and women of the time (Morgan; 1898). Chadwick, Ontarian families, 1: 176. The dairy industry in Canada, ed. H. A. Innis (Toronto, 1937). Farming, 14: 435. R. L. Jones, History of agriculture in Ontario, 1613–1880 (Toronto, 1946; repr. Toronto and Buffalo, N.Y., 1977). J. W. G. MacEwan, The breeds of farm live-stock in Canada (Toronto, 1941). Ontario Geneal. Soc., Leeds and Grenville Branch, Brockville cemeteries: St. Peter’s Anglican and the Old Catholic (Brockville, ). Ralph Selitzer, The dairy industry in America (New York, 1976). Types of Canadian women (Morgan). S. Lynn Campbell and Susan L. Bennett, “HARVEY, ELIZA MARIA,” in Dictionary of Canadian Biography, vol. 13, University of Toronto/Université Laval, 2003–, accessed April 24, 2019, http://www.biographi.ca/en/bio/harvey_eliza_maria_13E.html.